Oh, great. 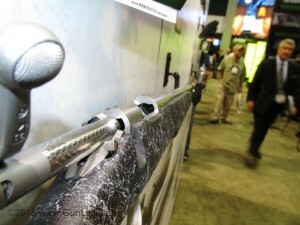 Another Remington 700 variant. Yawn; keep moving. Wait a second… that’s a front-loader? That’s pretty much what happened that got the GunLink crew to double back for an unscheduled visit as we strolled past the huge product art adorning the exterior walls of the Remington booth at SHOT Show 2015. Of course, we had planned to stop in to the Freedom Group booth anyway to visit various members of the family, but this new rifle caught our attention. The .50 caliber Remington UML appears to have a good start on living up to its name: the Ultimate Muzzle Loader. As much as the term may be overused, by all accounts the UML is a game changer in the black powder world. And it is sure to further ruffle the feathers of traditionalists who already don’t like the current crop of fast, powerful modern inline muzzle loaders that blur the line between muzzle loaders and centerfire rifles. In fact, unlike some other muzzle loaders, the UML is considered a firearm and is subject to the same regulation.